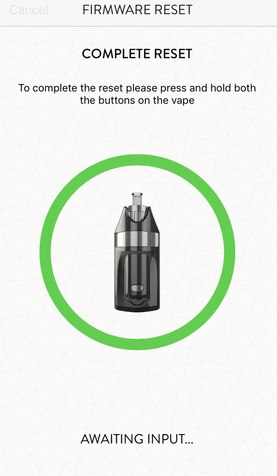 Every time I try to complete the firmware reset on the app, the update gets to 100% (full green circle around the vape icon in the middle of the screen), I then press and hold both buttons on the vape (as per what the instructions on the screen says), but then nothing happens! The app just says 'Awaiting Input...' near the bottom of the screen, and does not complete the reset. The lights on my vape are flashing from side to side (like I think it should be) but the darn reset just won't complete!! Fresh start each device, go through the pairing process but move the two units a bit as you pair.... A software engineer explained it to me once.... but I forgot. Something about the unidirectional antenna can't triangulate... bla bla.. all I remember. Virgil here with GHOST Vapes, thank you for reaching out for help on this. As always, thank you for helping and a particularly Interesting suggestion @EconMan. Worth trying imho. I'd like to get ahead of this as much as possible in the meantime so I'll be sending you a PM @Stravik so that I can gather your account information and get the ball rolling. Just tried this several times, but it was a no go for me ): Moved my devices around as I tried to pair, butttt to no avail lol Thank you for your suggestion though! It was definitely worth a shot. Please try as best you can to follow these steps in order. Any deviation from this sequence (as tedious/arbitrary as it may sound) will affect results. (5) Press and Hold the home and vape button down at the same time for 3 seconds to search for app (even though it still might be flashing yellow lights). (3) If a firmware update is available, you'll see a (1) next to "Firmware Update"
(6) Once done unit will flash 1 solid red LED 3x. Sure regret purchasing this based on the reviews I read on this Vapelife site and a few others. Got mine 2 days ago, worked fine for about 24 hours. After using the fast charger this morning after a second session mine turned into a brick. Having the same problem as Stravic describes. iPhone displays having firmware 1.4.0 and even though Ghost notified me (after a hard time contacting them, they don't answer phones) I was told I'd receive a return shipping label. (But who knows when) Tried to find a possible solution as these steps were unknown to me but after several tries these steps did not work either. Wish I had got the EVO. Hi Pat - its certainly and absolutely your prerogative to like or not like a vape as you wish. But may I ask please....you had it for 24 hours and seem to have had an infant mortality...that is, it died young....as electronics tend to either do that or last a long time. There is some infant failure rate on all electronics...all. Do you think you perhaps just got a bad unit and, based on all of the good reviews you looked at, and that yours is a bit of an outlier? Now, I don't know how long its going to take Ghost to get you a shipping label....but pretty much everybody I know thinks Ghost CS is one of the best they have ever experienced, in vaporizer industry or out. How long have you been waiting on a shipping label? Tagging @GHOSTTEAM here on the off chance they can make things right for you. P.S. - very few vape companies even publish a phone number lest answer it...shame, really. I think they all should have call in CS. Baron23 Checking out the comments on the vape critic website and a lot of similar complaints of the same problem occurring. Two hundred and ninety five dollars means a lot to a senior citizen/disabled veteran like myself. Had a cancer diagnosis back in 2015, not just vaping for the high. Thank you @Baron23 once again, always appreciate your help. Let me be the first to welcome to the vapelife forum and thank you for posting. I spoke with George, the CS representative you're working with, and the return shipping label should be emailed to you before today's end which is typical for our shipping department. I assure you we're taking care of you as quickly as possible. We look forward to making this right for you. Thank you Virgil. I hope you're right. I will definitely let you know. Hi Pat - me, 66, VN vet (USAF...the civilized military branch! LOL), retire on a fixed income, with a surgically repaired but continuing to degenerate back. I DEFINITELY am not free with other people's money. I hope dearly that Ghost will get you back in shape soonest. While I do hope you love your MV1 when its fixed up, I will suggest you save your shekels for an EVO also as its just a GREAT vape...but not cheap with the hydrotubes, that's for sure. Thank you Baron23. I served in the Air Force. Castle AFB (closed down now) and McClellan AFB both in California. KC135 Aircraft crew chief. Lots of TDY's over seas. Guess I just need to chill and give ghost a chance. My navy veteran neighbor was over a while ago telling me about all these fake online reviews people get paid for and it got me all riled up. Gotta keep the faith I guess and not put everyone's business into that scam category. I gotta admit..when it worked it was the smoothest vape I ever experienced. Then to have it die like that, geez, I already have the flag at half staff for our former president Bush. That's almost how it felt. Ha Ha. Thank you for your concern, I'll keep you all updated. Yes, do give GV CS a reasonable chance. No need to be an alarmest. You only emailed them on Friday, then presumably, they are closed on the weekend & now it's only Tuesday am & I'm sure there are others before you in the que. You'll see, they'll take good care of you & I have no doubt that you'll be very happy with the Ghost. As far as I know nobody gets paid on this forum, except maybe Bud - and he should have a raise. While I'm here I will add my voice to the chorus, If the past is any indicator Ghost CS will be more than fair with you, they have the best CS dept I have ever encountered. Thank you for your replies ZRN and Summer. I did some extensive trouble shooting today (reset modem and iPhone back to factory settings along with a lot of forum reading and a BLE scanner) I actually got it to work, without the app though. My MV1 still refuses to pair. iPhone reflects that it is connecting now, but with the BLE scanner the signal comes and goes. Don't know what will happen when I take out the batteries to charge again. That's where I first started having problems when I reinserted them again. Strange that it paired at first with no problem. I think I'm just gonna enjoy a few sessions with it as is tonight, try pairing it again tomorrow with the the reset instructions above...Hopefully I'll hit the jackpot. Thanks everyone that replied...you guys are awesome! To my surprise today a new ghost vape box was on my door step when I came home. I enjoyed using my vape without the app since I last posted. Charged up batteries and the vape was down for the count again. Tried 3 times to pair it again using the instructions posted above but no luck. Aside from the extensive trouble shooting I did yesterday....does anyone have any other ideas of what I might try doing before opening up the replacement package? delete the app from your phone and reinstall. Then try it. Thanks Dr green thumb for the reply. Been there done that like 20 times. I was mailed a new vaporizer from the kind folks at Ghost. ( I would have made me wait for the return label after that hissy fit I had) Anyway, I'm going to make one last try with my neighbor's iPhone to see if it will pair on their iPhone or iPad. If that doesn't work then I'll open up the replacement I was sent. If it does work I will gladly return the replacement I received..postage and insurance paid for myself. Thanks again for the reply. if the bluetooth on your phone is connecting to other bluetooth devices then it's the ghost if not it's your phone. I do not know your age or phone experience but I worked with cell phones for years and people would come in complaining only to find out the bluetooth was turned off on their phone. I did check all that, I even downloaded a BLE scanner and factory reset iPhone and my modem/router. I phone displayed that it was connected, BLE signal kind of came and went away then back again over and over. I've paired speakers before but that's it. My friend is coming over tomorrow with his new iPhone and iPad to see if we can pair it to one of those. He's a little more tech savvy than I am. If that doesn't work I'll open up the replacement and send this one back. Thanks again for checking in on me. @Pat Carter - it happens to everyone, but not everyone has the stones to say they were wrong. Congrats on resolving the issue and hope you enjoy the MV1 as much as I do. You aren't crazy for speculating that there's paid off reviewers that have no integrity either, it's just not this one. Bud's site and this forum saved me from a huge $300 mistake just by stumbling on his site after falling for TVAPE and their marketing "reviews" paid to be top google hits. If you believe them, the Zeus Arc is the greatest vape ever made and I had one pre-ordered. Found this site, canceled that overpriced BS and bought a Ghost MV1... am i ever thankful for Bud the Vapecritic! I'm glad it worked out for you, Pat! Very honourable of you, good form! My business partner and I saw an ad for the Herbalizer, a now defunct company who made a vape that looks like a UFO. It looked so cool. We were ready to buy. Then we did our due diligence. Found @VapeCritic review or it. Decided we wanted one. Found a price too cheap and made us suspicious. Come to find out, the company was bankrupt, it's founder ran off, venture capital guys took over, and I ended up buying a Plenty. Got my replacement yesterday and still have the same issues as the other. AppleCare confirmed that my phone was working properly and that it was an issue with the Ghost vape itself. Asked for assistance or any other ideas but like last time... I suppose they are too busy for customers to do anything more than offer a replacement. Gonna wait another hour or two and if still no reply, I'll ship it all back with the accessories and hope the refund process will not be as time consuming as trying to get the product to work. Done more than 20 hours trouble shooting, paid to return the second unit, and stood in line over an hour to do so. So looking forward to standing in that line again to return it all, as yesterday's email, today's chat and facebook message have yet to be replied to. AppleCare support case #100708758878 technician confirmed defective devices, my bluetooth working fine. And to think I almost bought a new iPhone wanting so bad for this vaporizer to work. UGH!!! Virgil here with GHOST Vapes. We're genuinely disappointed to see you've had these issues and we appreciate all the time you've put in on your end to try and resolve this on your own. George has received your ticket responses that came in after hours last night and from 2 hours ago and he has brought me up to speed with everything that has transpired until now. The good news is I've been able to resolve this exact issue with the following tips and it's my hope that they are successful once again. If the device is stuck (displaying 1 Amber LED moving side to side), please try the steps below. It looks like a lot because I made sure to be as painstakingly thorough as possible so as not to overlook anything (which would be a further unnecessary drain on your valuable time). That said, as intermediate as these tips may seem, it's imperative that you do not skip or transpose steps. I re-emphasize that these tips have resolved this issue in the past and I'm confident they will be helpful in this case. Please let me know if you have any questions or reservations about this information. Looking forward to resolving this for you. I've done all these steps at least a hundred times and three times with the apple care technician sharing my iPhone screen with me. But I will try once again.